Family Father is a trumpeter. Mother is a barber or hairdresser. He has an elder sister and a younger brother. His nephew got out school and is studying English and Chinese. Eyes color: Blue, grey, purple, ... It's up to feeling. Weight: 55-80kg. It's up to weight control. Foreign language skill: France, Mandarin Chinese. He's also interested in other languages, such as Italian, Spain, Cantonese, Korean, etc. Special skill: Hand-to-hand fight; karate, boxing, judo. However, he can't beat his father. Food/Dislike: Sweets, and he won't eat rice because it makes him fat. Favorite songs: Stair way to heaven by Led Zeppelin (First time he heard this song, he moved to tears. He's so surprised himself. ), Beauty & Harmony by Yoshida Miwa (He likes to sing this song.) And he likes to listen to soundtrack of many movies. Favorite singers: Yoshida Miwa (Dreams Come True), Crystal King, Metallica, etc. Favorite movies: Braveheart, Primal Fear, The Game, City of Angels, Soldier, Scent of a women. He used to be a drummer & vocalist of CAIN'S FEEL. After that, he joined "Malice Mizer" as vocalist. 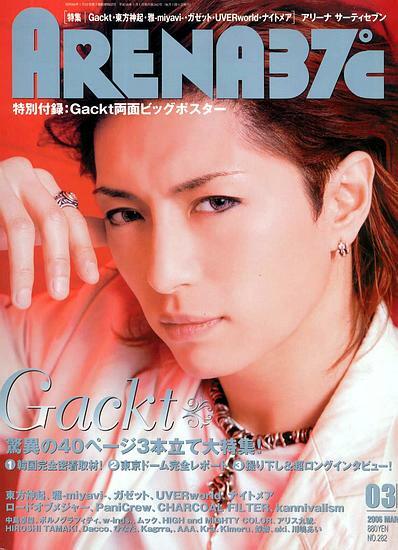 In 1999 Gackt officially left Malice Mizer and started his "Gackt JOB".